After filing for bankruptcy, Trident Microsystems (TRIDQ) was written up as an equity investment on the Distressed Debt Investors Club (as well as VIC) earlier in the year. For those interested in some background, here is the docket: Trident Microsystems Bankruptcy Information. A central components of value for a possible recovery for shareholders (there has been an equity committee appointment) is the value of Trident's set top business. 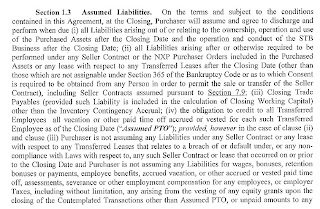 "The Sellers (Trident) entered into that certain asset purchase agreement, dated January 3, 2012 between the Sellers on the one hand and Entropic Communications, Inc. (the “Stalking Horse Purchaser”), pursuant to which the Stalking Horse Purchaser shall acquire the Purchased Assets on the terms and conditions specified therein (together with the schedules and related documents thereto, the “Stalking Horse Agreement,” a copy of which is attached hereto as Exhibit B). 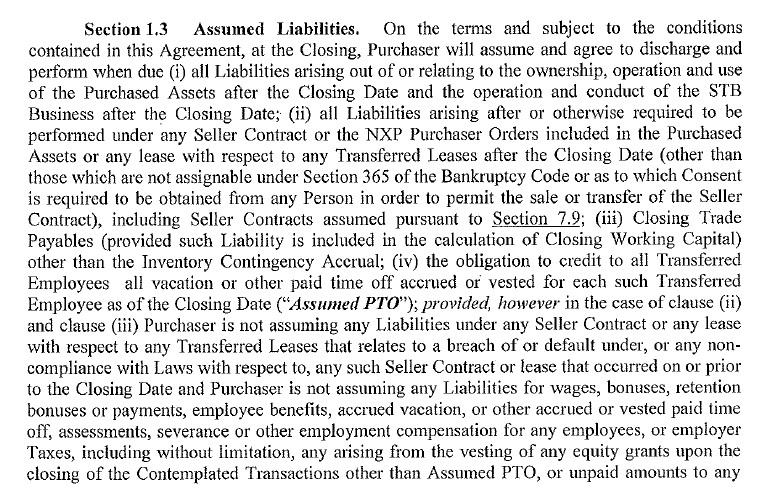 From the Asset Purchase Agreement originally filed with the court, here is the defintion of assumed liabilities. "We’ve got $55 million in cash, and the testimony will show today another assumed liabilities of about $18 million. So at $73 million, we see this bid protection at 6%." So the cash value is $55M and the assumed liabilities are to be valued at $18M for $73M of value to the Trident estate. The auction for the set top business was set to occur this past Thursday (remember that date). "SAN DIEGO, Feb. 27, 2012 (GLOBE NEWSWIRE) -- Entropic Communications, Inc. (Nasdaq:ENTR), a leading provider of silicon and software solutions to enable connected home entertainment, today announced it has been selected as the successful bidder to acquire Trident Microsystems' set-top box (STB) system-on-a-chip (SoC) assets for a purchase price of $65 million, a $10 million dollar increase to its original offer. Today's announcement follows the completion of an auction, and the final transaction is subject to approval of the United States Bankruptcy Court for the District of Delaware. A court order authorizing Trident to sell the STB SoC assets to Entropic is expected to be entered on or about March 6, 2012. "This acquisition marks an important milestone for Entropic and is an exciting new chapter in our company's history, enabling us to combine our best-in-class MoCA solutions, including MoCA 2.0, with Trident's STB SoC business to deliver a complete system solution to the world's premier cable, telco and satellite service providers, while expanding our total addressable market over the next several years," said Patrick Henry, president and CEO, Entropic. "Our successful bid brings us closer to adding Trident's complementary assets, portfolio, research and development and global presence to Entropic. We believe the acquisition brings inherent value to both organizations' customers, employees and partners, and we look forward to closing the transaction." Entropic expects to make employment offers to approximately 375 Trident employees worldwide. The transaction, which remains subject to customary closing conditions, is expected to close by the end of the first calendar quarter of 2012. Entropic will provide additional details as to the financial implications of the transaction and guidance for the combined business following the close of the transaction." For all intents and purposes, if this was your sole source of information, you would think, as a TRIDQ shareholder, you were receiving an extra $10M in possible recovery proceeds. "As the Court is aware, we had an auction of the set top box assets yesterday in New York. The auction ended this morning at 2:47 a.m. in New York, and everyone made it down here on time, Your Honor. It was an enormously successful process. I think all of the creditors and stakeholders would agree to that. The value to the estates was increased by close to 40% through the competitive bidding of the two parties who were present. Because of SEC disclosure issues with respect to the prevailing bidder, they have requested that we not announce the identity of that bidder until Monday." 40% higher than the aforementioned $73M of value is a value closer to $102M. Not the $65M value listed in today's press release from Entropic. 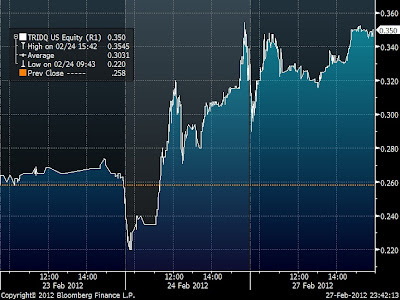 You can see the value jump on the 24th when Chesley of DLA Piper noted that the value to the estates increased by 40%. You would have had absolutely no idea what was happening with the move on the stock price unless you had called into the court on Friday. Further, you may have been disappointed this morning with only a $10M bump in the purchase price. Proceeds and value to the estate are very different things. Yes, only $10M more of cash, but a nearly $30M increase in the value to the estate. $20M of value / 183M shares is akin to 11 cents which is enormous considering a 35 cent baseline. Disclosure: I am long TRIDQ stock. Last week, the Financial Services Authority released its transcript that they used (as evidence) to fine David Einhorn 7.2 million pounds in relation to Greenlight selling its stake in Punch Taverns after a conference call with Punch's CEO. I have tremendous respect for David Einhorn and Greenlight Capital and am a huge fan of Einhorn's book Fooling Some of the People All of the Time. I think opining on the subject matter at hand is impossible given the one sided nature of the news flow / information (i.e. FSA is in the power position here). With that said, I thought one of Einhorn's comments on the conference call was quite interesting for our readers. "Right. You know, it seems to me that -- that much of the potential attractiveness of coming and selling equity at this point stems from probably the fact that a few months ago the equity was at 40 pence, and now it’s at a £1.60 or something like this. And so, it’s up from the bottom. On the other hand, if you look back a couple of years ago, it’s -- the equity is really down a lot. It trades at a very low multiple of the book value and, you know, the comp – the company -- the equity continues to trade as if it’s really an option on the debt side of the capital structure. That’s -- that’s the way that we look at it. And we think it’s a very cheap option because of the types of things that you’ve been -- already been able to execute on, and I think that you’re going to be likely to be able to execute on, uh, going forward. I think that in -- if the equity was -- was overpriced and you had an opportunity to reduce the financial risk of the company, I think it would make some sense to considering equity at that point. But I think, if you just looked in a slightly different world and thought “Jeez”, if the stock had come from where it was and it had never gone to 40 pence but instead was sitting at 1.60, then 1.60 represented a new low, down from whatever previous higher price it had used to have been at, I don’t even think you would be considering selling equity at this point." I would say as a -- I would say as a rule of thumb, if the market capitalization of the equity is less than half of the face value of the debt, the -- the stock remains sort of in an option area. "We bought small stakes in 22 companies in late 2008 that we thought would survive, even though they traded as if they would fail. They all survived." I ran a screen in Bloomberg using this aforementioned rule of thumb (excluding financials) on companies with a market cap of $100M. The usual suspects turn up: HCA, Sprint, Hertz, CYH, CZR, lots of shipping names, RAD, HOV, most of the airlines. Frankly most of these names are well studied and followed by the high yield community. I wanted to get a sense of the weighted average (by market cap) return of these names this year. I thought the number would be good - but didn't realize it would be this good: 17.3%. The biggest winners on the list were EGLE and HOV, followed by a number of ADR Solar companies and airlines. There have been many academic papers written about the concept of equity as an option in regards to debt. Because equity is at the bottom rung of the ladder, as the value of the firm increases, the call option of equity becomes more in the money. If a firm is liquidated, and you receive zero, you are out the premium you paid, which is in effect the price of the stock. The exercise price in this example is the amount of debt outstanding. In theory this is all well and good. A better way to think about it, in my opinion, is to think of a number of expected values for a number of scenarios. 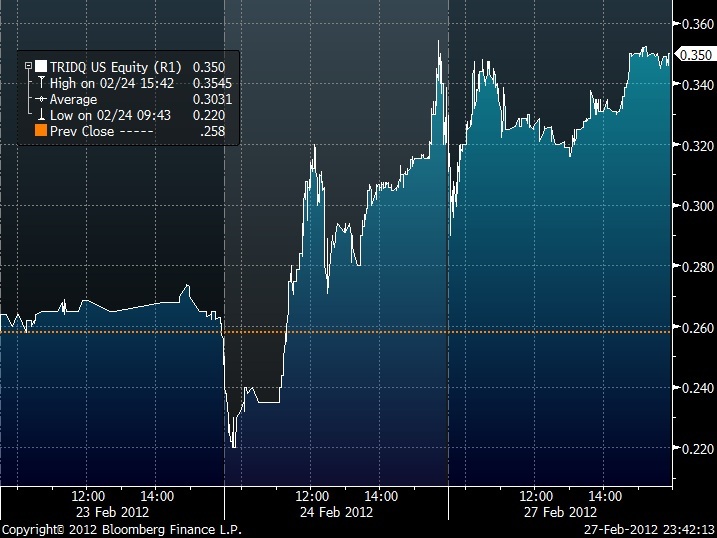 Let's use something like Hovnanian's equity. We can construct a myriad of scenarios for recovery of the various parts of the capital structure. For simplicity, let's take three examples: 1) Housing roars back, HOV crushes it and generates a ton of cash flow, 2) Housing meanders where it is, and HOV muddles along until it runs out of cash, 3) Housing falls off a cliff, and HOV is forced to liquidate. As the probability of scenario 1 increases, the value of HOV's equity should also increase. When the stock was at a dollar just a few months ago, the market's view of the plausibility of scenario 1 was very low, with the balance allocated to scenarios 2 and 3 which have more consequence for recoveries of the right side of the balance sheet. Under scenario 1, the default rate would spike to historic levels: Remember, very few issuers ever pay off their debts - they just constantly refinance them. Under scenario 2, there would be no defaults as companies could just issue debt to refinance maturities, plug cash shortfalls, etc. 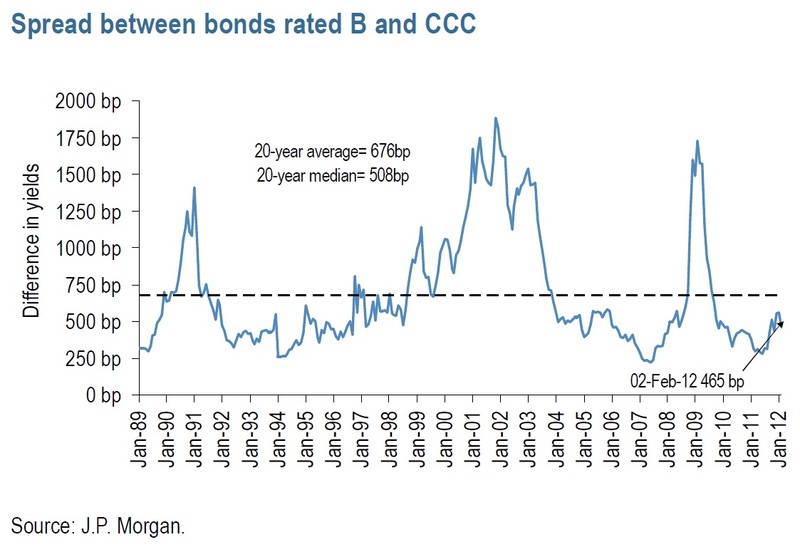 The last few years have been amazingly volatile in terms of the openness of the credit markets. Currently they are pretty open (again a 4ish on the risk spectrum), but still doesn't feel like early 2007. But over the past 36 months we've seen credit markets that felt very frictional - only the best issuers could issue into the market. 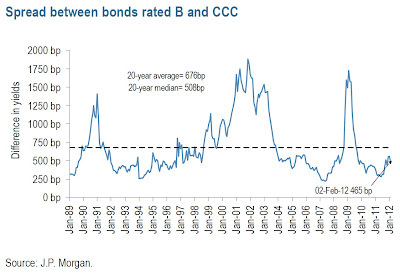 And this volatility of the availability of credit is, in my estimation, a major driver of returns of many players participating in junior parts of the capital structure (include sub debt). Unfortunately, this is a macro construct that is hard, if not impossible, to forecast. Valuation is always of the utmost importance. We want to buy 50 cent dollars all day long. In a perfect world, with locked up capital, no redemptions, and no monthly/quarterly performance numbers to defend, we could do that and probably do a fine job at it. Unfortunately, only few funds have that luxury. With that in mind, at times like these when levered equities have massively outperformed the major indices, each of us should be watching closely the spigot that is credit for signs of a pullback that could ultimately hurt otherwise well positioned companies. This is our final installment of the notes from iGlobal's Distressed Investing Summit. Our contributor, Josh Nahas, of Wolf Capital Advisors did an amazing job on this series - and tonight, with a more macro bent, is no exception. Later this evening, I have a post on David Einhorn's view on levered equities, and this weekend a comprehensive post on the RMBS market, using material penned by Canyon Capital. Enjoy! In the third installment of our coverage of the iGlobal Distressed Investing Summit we are going to focus on the Risk Management panel. 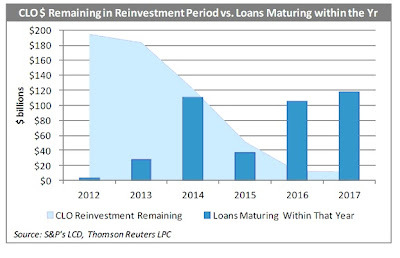 This panel represents and interesting counter point to the views expressed by the Leveraged Loan panel which given the current technicals in the HY/Leveraged Loan markets is quite bullish about the prospects for those markets. While it is hard to dispute the current technical factors driving spreads tighter, the question really is whether the underlying economic fundamentals can support the cash flow needed to support a deleveraging of the many broken capital structures out there. If you look at the data presented by the Risk Management panel the answer is decidedly negative without serious impairment to creditors and existing equity holders. A note of disclosure, the charts in this article are not from the presenters but are based on topics referenced by the presenters. Many of the conclusions are extrapolated from the panelists’ remarks and therefore represent the author’s own opinion. The panel kicked off with an interesting way to look at risk defined as Risk = Exposure + Uncertainty. 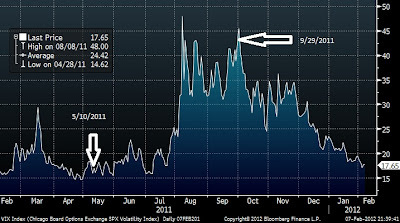 Uncertainty and corresponding volatility has plagued the markets since the credit crisis ended in 2009. 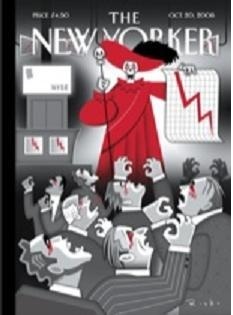 Since then there have been periods of exuberance, the first 6 months of 2011 and the last 3 months , along with violent sell offs in July and September/October of 2011. This lead one panelist to observe that the “The pain of uncertainty is ALWAYS greater than the certainty of pain”. The tepid the economic recovery, uncertainty regarding regulation and increasing negative public sentiment towards the financial sector has created a great deal of uncertainty in the markets over the direction economy has caused sharp turns in the market. These types of rallies and sell-offs are more reflective of secular bear markets which can see large rallies followed by steep sell-offs and prolonged stagnation. The economic fundamentals paint a bleak picture indicating that these market rallies are likely technical driven and unlikely to be sustained. Some startling facts include that 72% of GDP is driven by consumption while 10% of Americans are responsible for 40% of that consumption. With a great deal of that 10% employed by the financial sector which is under increasing pressure, the ability to sustain growth in GDP is limited at this point. Moreover, the outsized attention paid to manufacturing vs service by politicians distorts resources away from the areas that will drive growth in the future. Given that manufacturing accounts for such only about 12% of GDP, it is mathematically impossible for it to drive GDP growth. During every previous recession since the Great Depression household net worth grew on average 4%, however, in this previous recession house hold net worth fell almost 25%. The consumer represents almost 150% of GDP including debt, combining this with the drop in net worth portends badly for the fundamental economic outlook. According to the panel, the US consumer has experienced 13 consecutive quarters of income decline. Which begs the question of how we can have a sustained rally in the credit and equity markets with such weak underlying fundamentals? 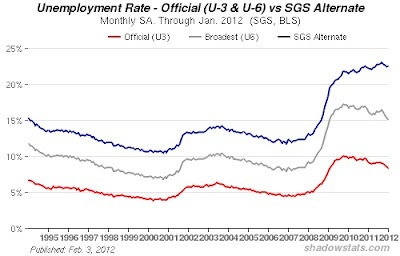 Moreover, the unemployment statistics based on the U3 calculate by the BLS and frequently cited in the press and by politicians arguing that the economy is improving are misleading. These headline unemployment numbers do not include those who have stopped looking for work, those who have been out of work over 6 months, or those who are under employed. Moreover, headline monthly unemployment numbers are subject to revision as the result of the birth/death adjustment which attempts to estimate how many jobs were created as the result of new businesses being formed as well as those lost by firms going out of business. These estimates tend to overstate the number of jobs created and are subject to big downward revisions in later months. The BLS’ U6, which is a much broader measure of and includes those who need work but have given up the search, and those who have taken part-time jobs while still seeking full time employment. In February, that figure rose by 0.6% to 16.0%. 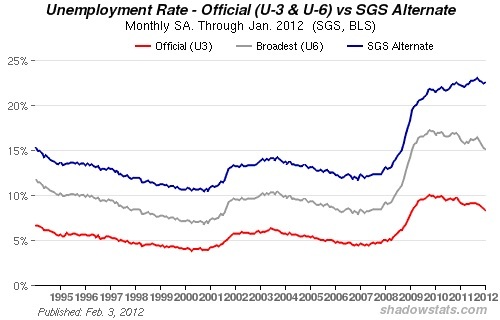 The U3 unemployment numbers have been further distorted due to adjustments made as a result of the 2010 Census. The BLS has indicated that the current series is no longer comparable to historical data as a result and has not supplied what the adjustment is. 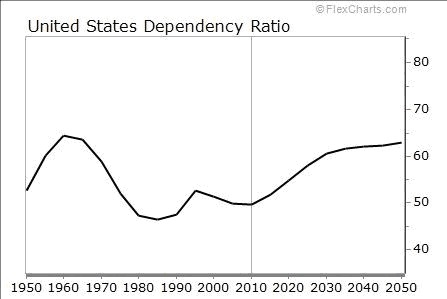 Compounding the already strapped consumer are demographics which are going to be a drag on growth over the next couple decades as more baby boomers retire. The dependency ratio, or those who are out of the labor force (usually over 65 ) vs those in the labor force 65 is steadily increasing indicating that there are more retirees than workers. This is going to cause significant tension with respect to entitlements and taxes between those in the work force and the retired population. This will put additional strain on workers in the form of additional taxes or force retirees to take less benefits. Neither one of these are politically attractive and at this point we seem to have found a third option which is called quantitative easing, or more accurately printing money. This will ultimately result in inflation, which the panel expects to see an outbreak of at some point. The panel also mentioned that current government statistics do not accurately capture inflation. 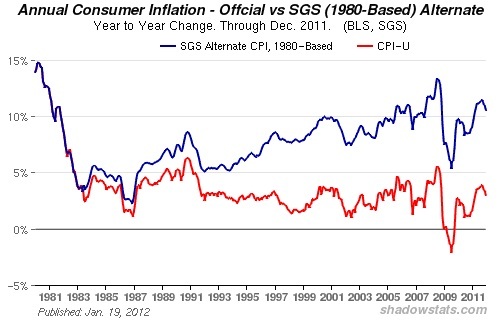 This is the result of changes to the CPI’s calculation during the 1990s by the Boskin Commission (See ShadowGovernmentStats.com for a complete explanation). 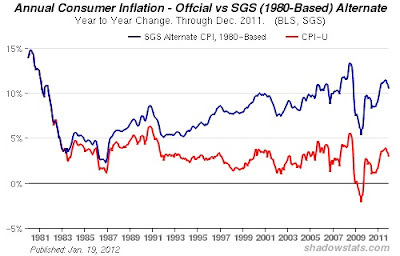 As a result CPI no longer accurately reflects the cost of a basket of goods used by the average consumer, but is now distorted by econometric adjustments. Under the old method of calculating CPI inflation would is running almost double the official statistics. Short term technical trends favor leveraged credit instruments in 2012. At the end of the 2011 and to start 2012 we saw managers begin to put cash to work that has been sitting on the side lines for some time. Given that large inflows into HY/Leveraged Loan funds, managers were going to have to start putting money to work. Banks then pounce with as many new issues in their pipeline while the window is opened. We saw this same pattern in 2010 and 2011. Furthermore, election years tend to be good years and spending will be in excess of $2bn. While technicals will dominate in the near terms, given the longer term fundamentals the panel has highlighted indicates that there still needs to be a substantial deleveraging. Wall Street is focuses on the balance sheets of fortune 500 companies, but it’s the balance sheet of middle market companies and consumers that drive GDP at the margin. Since growth by definition is at the margin, it appears that the US economy is facing at best prolonged economic stagnation or another contraction. 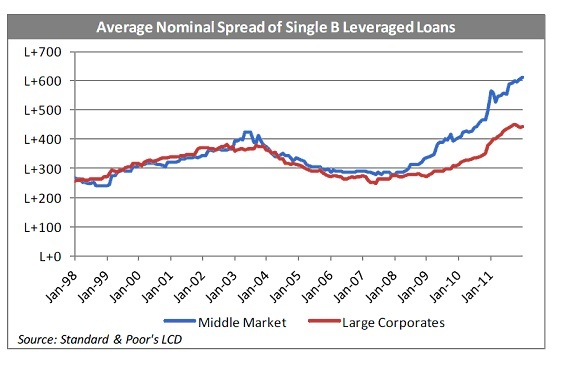 As evidenced by the chart below the spread on Middle Market loans to large corporate loans are trading at significant premium to their historical average. On the plus side the banking system does appear to be on sounder footing and far less leveraged to exotic instruments such as conduits, arbitrage CDOs and subprime. 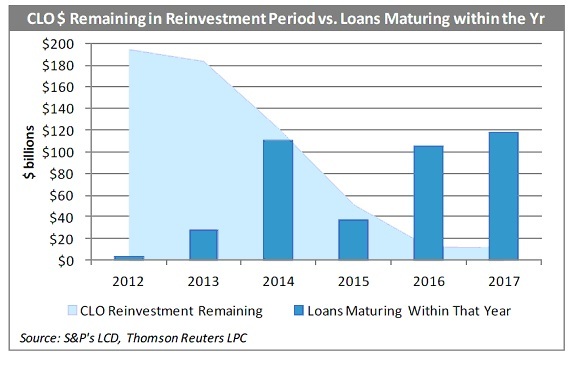 Nevertheless, given the large stack of maturities between 2015-2017, particularly for middle market borrowers who have not been able to refinance, there will be significant restructuring activity as these companies are forcibly deleveraged. 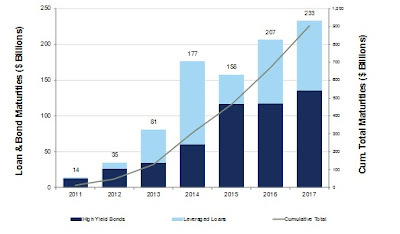 Compounding matters is the fact that by 2016-2017 all of the vast majority of CLOs will be outside their reinvestment window, which has been a major drive of the current A&E cycle. Moreover, many of these CLOs will be approaching their own legal final maturities and therefore will not be able to extend even if they wanted to. New CLO activity is running at a fraction of its historical highs seen in 2007 at $150bn annually. 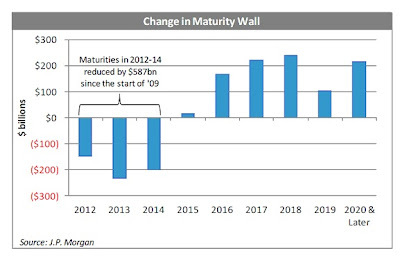 For 2012 CLO issuance is expected to be about $12bn. Not nearly enough to replace the lost supply. Europe appears to have pulled back from the abyss with ECB now embracing the US approach of monetizing the continent’s debt problems. 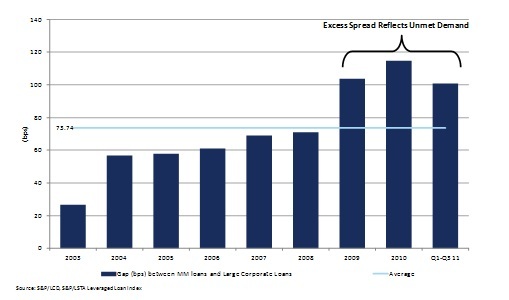 During the 2001-2007 credit boom European banks were large investors in CLOs and other leveraged US credit products. Now European banks are investing in sovereign debt which the ECB is accepting as collateral for ECB loans and capturing the spread. The recap of southern rim EU countries is essentially being financed by the ECB who is providing the banks with cheap loans secured by sovereign debt. This is why sovereign spreads in Italy and Portugal have been tightening in their latest government bond auctions. 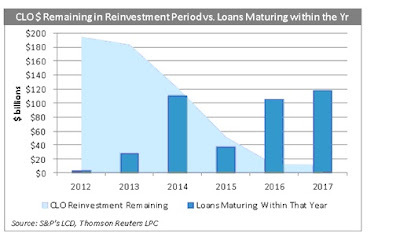 With this money no longer flowing into the US market, and CLO activity no where near its historical levels in the boom years, HY and Leveraged loans will need to find new sources of demand to meet the 2015-2017 maturity wall. Moreover, given that the US’s large budget deficits are being financed with Treasuries, might produce a “crowding out effect” on the HY market and lead to much wider spreads. This past week, iGlobal hosted its 3rd Global Distressed Investing Summit at the Park Central Hotel in NYC. The event covered a broad range of topics and opportunities from distressed middle market bank debt, distressed CMBS and Commercial Real Estate, to the return of CLOs and the impending maturity wall. Distressed Debt Investing's contributor Joshua Nahas was in attendance taking notes (and speaking on panels). This article will cover the morning session, while his next article will cover the afternoon panels. Enjoy! The morning panel started off with a discussion of Distressed Strategies and the State of the Capital markets. As anyone following the High Yield and Leverage Loan space knows, the market has been experiencing strong performance since December and is up almost 3.5% in the December-February period. As a result many of the larger on-the-run HY credits have been accessing the capital markets and pricing for all risky assets has improved. Access to capital is much more credit specific which is creating opportunities for distressed players. Additionally, the improved overall market has led banks to be more willing to put loans up for sale at distressed prices. From a distressed PE perspective this has limitations given their focus on a 2x return on capital, not an IRR. In many instances there is not enough of the loan available or the size of the issue itself does not allow for the deployment of sufficient capital to meet the return threshold. Nevertheless, panelists pointed out the there are always opportunities resulting from poor management to economic dislocation that there is no lack of potential deals. In 2011 Versa looked at over 640 deals in 2011 and is seeing more opportunities coming in from distressed trading desks. Given the uncertainty over the elections and regulatory environment she predicts less robust M&A activity from strategics and feels that PE firms will have to look to dividend recaps for liquidity. With respect to distressed real estate, Spencer Garfield of Hudson Realty Capital is seeing strong deal flow, albeit at higher prices than a year ago. Where they were once able to purchase pools of distressed CMBS at 18 cents on the dollar they are now seeing prices in the 30-50 cents range. Both securitization and conduit lending have returned as many distressed CMBS deals have been cleaned up and recapitalized and can be placed in to securitization vehicles. S&P did throw a monkey wrench into the process when it without warning altered its ratings methodology for CMBS deals, but the market has adjusted. Another area of the market rich in opportunities is special situation lending. As pointed out earlier, the markets are open for selective credits, however, most lower middle market and small business have little or no access to bank or capital markets. Brenden Carroll of Victory Park Capital sees a market with increasing negotiating leverage for lenders. When companies think they can access the capital markets they tend to shop deals for a long time before coming to a specialty lender such as Victory Park. However, he has seen more CEOs increasingly concerned about the operating environment who are willing to accept onerous term sheets on the first go round. In cases of sponsor owned companies they are more willing to accept higher interest rates in lieu of equity give ups while family owned business will accept dilution in exchange for a lower yield. This is driven by fact mention earlier that sponsors need to affect a 2x return on capital, any dilution significantly impairs returns from that perspective. 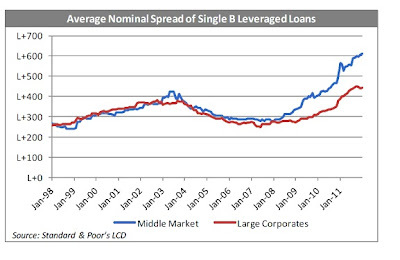 As a result of the liquidity squeeze and 2008 credit contraction we saw many new players entering the distressed space. Robert Koltai of Hain Capital pointed out that many of these players entered to take advantage of large cases such as Lehman and began trading products such as trade claims. However, outside of the Lehman complex many of these instruments are incredibly illiquid and labor intensive to administrate. It is not clear whether these players will remain in the market absent significant new large Chapter 11 filings. While this should increase expected returns, it may impact liquidity. Liquidity has become a major factor as dealers begin to implement the Volker rule and allocate less capital to trading and holding inventory. 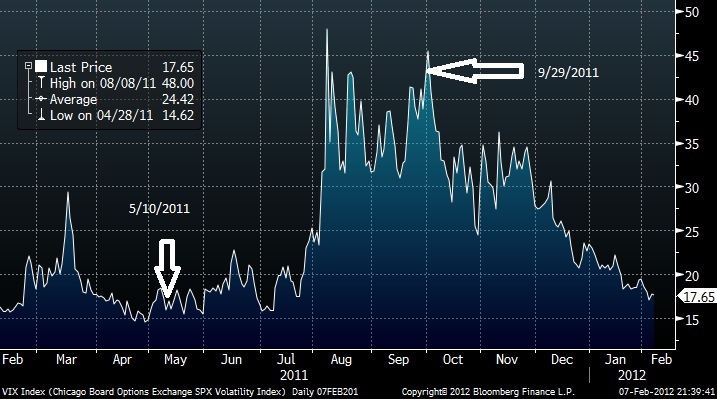 This is likely to exacerbate volatility and have negative unintended consequences. Another factor that will be impacting liquidity and market opportunity is the shifting of many large PE funds to their harvesting periods. It was pointed out that 6,000 companies were acquired by Financial Sponsors between 2005-2009. Given the average fund has a life of about 10 years, sponsors are going to need to star realizing investments. Moreover, there is still an overhang of $400bn in undeployed capital in the hands of Private Equity. Since they are unlikely to return the cash to investors and forgo fees and carried interest, they will need to begin to put the capital to work before the investment periods of their funds close. While these windows can be extended, it cannot be done indefinitely and it will be interesting to see how the deployment of this capital impacts the market. Assuming 4x leverage the $400bn in equity capital equates to $1.6 trillion in buying power. One of the more interesting panels was the Opportunities in Distressed Private Equity discussion. The participants were heavily middle market focused, and it given how picked over the large cap distressed/HY universe is more and more funds are wading into the middle market. In essence they are willing to exchange liquidity for better returns. In middle market deals there is far less liquidity and when you enter a distressed one, you have to assume your only exits are a refi (unlikely if its in distress), sale, or restructuring and converting to equity. The returns are more akin to PE than HY/Distressed but you need to have the expertise and appropriate fund structure. Many large distressed funds have rolled out middle market platforms to capitalize on these opportunities. Interestingly, the PE firms that used to have this space to themselves are finding increasing competition from their distressed debt counterparts and are having to become more flexible, including taking non-control stakes, purchasing debt in the secondary market and making DIP loans. Hussey Copper auction where you saw companies vying for the stalking horse bidding slot and the asset was finally sold for almost 12x EBITDA. According to Varun Bedi of Tenex Capital we have entered a Dickensian “tale of two markets” where larger companies with international diversification have access to capital while smaller domestic companies do not. This creates opportunities for funds such as his that have significant operating expertise. Most middle and lower middle market companies are experiencing gross margin pressure from both rising input and energy costs. Their lack of international diversification makes it hard for them to generate pricing power and leaves them vulnerable to deflating consumer demand in the US. At this point these companies have taken out most of the low hanging fruit in their SG&A and now need to restructure their balance sheet and pursue more operationally intensive restructurings. Another factor impacting these companies is that deferred capex which has moved from 4% of revenue to 2% of revenue over the last couple of years. This leaves little opportunity to drive growth and generate the necessary working capital to fund expansion. Given that we are likely in protracted period of below potential GDP gowth, or worse potential GDP is has moved lower, these businesses will need to restructure and recapitalize. 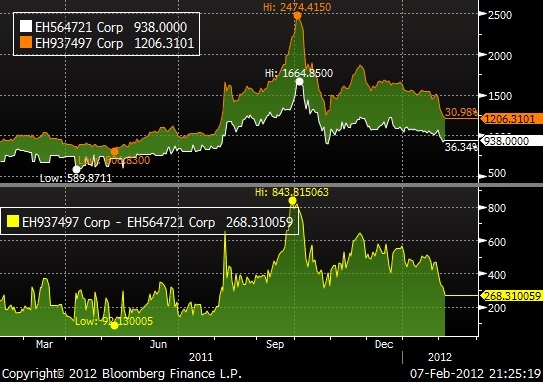 As mentioned earlier Distressed PE firms are seeing increasing competition from their distressed debt counter parts. David Simon of Littlejohn & Co pointed out the need for increased flexibility and creativity in structuring deals including finding ways to effect control without having 51% of the economic ownership through board control or other provisions. Moreover, PE firms are becoming more active in the secondary debt markets as way of being in position prior to a trigger event. In general, he has found that the PE funds and Hedge Funds are a good compliment to one another as most hedge funds do not have the infrastructure or operating principals to manage businesses and are more than willing to let the PE firms handle those aspects. As far as future opportunities, Littlejohn expects corporate carveouts to be a good source of deal flow as companies have now stabilized from the 08-09 dislocation and are willing to divest lagging businesses. It was also noted that while in distressed for control transactions funding is still available, the diligence process has become much more disciplined and takes far longer. In concluding the Distressed Private Equity panel, Mr. Simon provided an interesting observation with regards to corporate turn arounds. It is getting more difficult to attract and retain top talent even in light of significant equity should the turnaround succeed. In most cases these positions are not in the most desirable locations and younger executives are less apt to stay for the duration of a turnaround. The morning session concluded with panels covering trends in distressed investing as well as one covering domestic opportunities. One of the trends highlighted was the changing structure of many distressed and PE funds. Many distressed funds were structured to offer quarterly or annual liquidity during the credit bubble because that made it easier to attract fund-of-funds money. However, this had a disastrous effect during the 2008-09 period as many funds were hit with a wave of redemptions when they needed to be deploying capital. In addition, many distressed funds had suffered from style drift and had taken on large amounts of leverage through TRSs in order to flip new issues and juice returns on leveraged loans. In the aftermath funds are now looking to lock up capital for longer periods and we are seeing longer lock ups as well as PE based structures with investment and harvest periods and 5-10 year locked up money. Better matching of assets (investments) and liabilities (investor capital) is critical for the distressed asset class where a bankruptcy can last several years or an operational turn around can take several year to realize. As was mentioned earlier PE funds are also having to adopt as more distressed funds move down market and are taking larger, less liquid stakes in private companies. The morphing of the PE and Hedge Fund structure is likely to continue in the distressed space as PE funds seek the ability to invest in debt instruments and hedge funds look for more stable capital. Micahel Cerminaro of Sound Harbor Partners pointed out that funds need to have the flexibility to pursue opportunities that maximize risk-adjusted returns across the capital structure. The ability to capitalize on senior secured loans with high teens to low 20s IRRs is essential when there are fewer opportunities to write larger equity checks for control. Having the right structure including being able to make your pref return (usually around 8%) and still generate a sufficient return is essential. This may include more flexible recycling provisions and the ability to utilize side cars with you LPs when necessary. Duran Curis of Ocean Avenue Partners which invests as both an LP and a co-investor relayed that they want to be active in investing alongside the GPs in order to maximize returns and minimize the drag from fees. Again we are seeing increasingly more creative structures as funds learn from the 2008-09 and adapt accordingly. In addition to trends in fund structures, Robert Kline of R.W. Kline Companies which specializes in distressed commercial real estate is seeing opportunities in discounted note purchases and restructurings of CMBS tranches. They have been active in recapitalizing and restructuring distressed CMBS pools and are seeing a lot of interest in Real Estate assets, particularly luxury hotels which have attracted sovereign wealth funds attracted to their premium brands. Another trend in the lower middle market space was highlighted by Raquib Abdullah of BFG Holdings which specializes in distressed lending and private equity for small and middle market businesses. They generally offer debt financing at reasonable rates (12-15%) to privately and family owned businesses in exchange for taking a large share of equity 50-80%. Unlike traditional sponsor owned companies, these businesses are willing to give up large shares of equity in order to keep their businesses afloat. Mr. Abdullah has seen more of these opportunities being sourced from banks who need to clean up their balance sheets and are looking to move problem loans and avoid liquidations which will yield de minimis recoveries. In the next article we will cover some interesting topics including the impending maturity wall, risk management and economic fundamentals for the US and Europe as well as the global macro picture. Stay tuned. It is my pleasure to introduce readers to a net set of contributors to Distressed Debt Investing. As I've spoken about in past months, I've been trying to add a number of regular guest writers that cover topics ranging from advanced distressed / bankruptcy concepts to European distressed debt situations. It's my pleasure to introduce three lawyers from the bankruptcy practice at Dewey & LeBoeuf LLP: Martin Bienenstock, Phil Abelson, and Vincent Indelicato. Dewey has a fantastic practice in the restructuring / bankruptcy space and we are absolutely thrilled to have them as regular contributors. Enjoy! With the increasing participation of distressed hedge funds in chapter 11 cases through the collective action of ad hoc committees and groups, Federal Rule of Bankruptcy Procedure 2019 (“Bankruptcy Rule 2019”) ignited vigorous debate over the scope of its disclosure requirements in recent years. The controversy set in motion a titanic collision between bankruptcy judges who wanted to know which litigants held short positions and wanted the debtor’s estate to fail or diminish, and a distressed investing community that has fiercely guarded proprietary trading strategies. In an ostensible effort to shatter the judicial uncertainty surrounding the application of Bankruptcy Rule 2019 in modern day chapter 11 cases, the Committee on Rules of Practice and Procedure of the Judicial Conference of the United States proposed a series of amendments which the Supreme Court of the United States adopted into law last April, effective December 1, 2011. Although the drafters of amended Bankruptcy Rule 2019 sought to bring much needed clarification, the new rule did not directly address its target. The new rule could have required that each group member simply declare whether it owned any economic interests that would increase in value if the debtor’s estate decreased in value. It does not do that. Rather, the new rule requires listings of each group member’s economic interests. In some cases those listings will make clear whether the member benefits from the estate’s diminution (i.e., short sales of debt). In other cases the court will only be able to scratch its head (i.e., synthetic total return swap). Parties Required to Disclose: Amended Bankruptcy Rule 2019 requires disclosure by “every group or committee that consists of or represents, and every entity that represents” multiple creditors or shareholders “acting in concert to advance their common interests.” Fed. R. Bankr. P. 2019(b)(1)(A). Notably, the new rule defines “represents” as “to take a position before the court or to solicit votes regarding the confirmation of a plan on behalf of another.” Fed. R. Bankr. P. 2019(a)(2). A group of creditors or shareholders that retains a law firm to monitor case developments without a court appearance does not fall within Rule 2019 disclosure requirements absent its solicitation of votes or other acts in concert to advance their common interests. Significantly, amended Bankruptcy Rule 2019 contains numerous ambiguities that present a fertile source for litigation as bankruptcy courts begin to enforce the new rule. For example, when and if it takes a position in court as a group, Rule 2019 disclosure would be triggered. Other acts to advance the group members’ common interests are subject to many meanings. Does it mean discussions with parties in interest by or on behalf of the group? Negotiations with parties in interest by or on behalf of the group? Are entities that execute a plan support agreement or secured lenders that submit a joint credit bid “acting in concert” in a manner that compels 2019 disclosure? Indeed, the answers to these and other questions may ultimately determine the strategies that distressed debt investors pursue at the outset of and throughout a chapter 11 case. Scope of Disclosure: Those parties required to make disclosures under the amended rule must file a verified statement that shall include “the pertinent facts and circumstances” surrounding the formation of the group or committee. See Fed. R. Bankr. P. 2019(c)(1) (as amended). Specifically, in the case of a committee or group, each member must provide (i) its name and address and (ii) the nature and amount of its “disclosable economic interests” held in relation to the debtor as of the date of the statement on a member-by-member basis, and not in the aggregate. See Fed. R. Bankr. P. 2019(c)(3) (as amended). Members of a statutory committee, however, must only provide this information as of the date of committee formation. See Fed. R. Bankr. P. 2019(c)(2)(B) (as amended). Although the new rule does not require a group member to disclose (i) the price paid and (ii) the specific acquisition date for each of its disclosable economic interests, a member of a committee or group that claims to represent an entity that is not a committee or group member must disclose the quarter and year in which it acquired each disclosable economic interest, except for those disclosable economic interests acquired more than one year before the petition date. See Fed. R. Bankr. P. 2019(c)(2)(C) (as amended). The phrase “claims to represent” may relate to those situations where an ad hoc group purports to speak on behalf of an entire class of creditors or shareholders without any instrument evidencing the express authority to do so. Most importantly, distressed debt investors must understand that nothing in the new rule eliminates the ability of a judge or party in interest to discover the price paid and the precise date of acquisition for each of an entity’s disclosable economic interests. Like old Bankruptcy Rule 2019, the new rule does not require disclosure by indenture trustees or agents or class action representatives. See Fed. R. Bankr. P. 2019(b)(2) (as amended). Disclosable Economic Interests: While amended Bankruptcy Rule 2019 does not require a party to disclose the price paid for its holdings, the new rule expands the scope of disclosure to include any “disclosable economic interest.” The amended rule defines “[d]isclosable economic interest” as “any claim, interest, pledge, lien, option, participation, derivative instrument, or any other right or derivative right granting the holder an economic interest that is affected by the value, acquisition, or disposition of a claim or interest.” Fed. R. Bankr. P. 2019(a)(1) (as amended). Translated, this definition encompasses all long and short positions, including, without limitation, all options, swaps, derivatives and other claims relating to the debtor’s securities and other debts. Supplemental Statements: Amended Bankruptcy Rule 2019(d) requires a party to file a supplemental 2019 upon the material change of any fact previously disclosed in a Rule 2019 statement whenever it takes a position before the court or solicits votes on the confirmation of a plan. See Fed. R. Bankr. P. 2019(d) (as amended). The conspicuous absence of any definition of “materiality” in amended Bankruptcy Rule 2019(d), however, makes compliance with this section of the new rule very challenging. Parties required to disclose under amended Bankruptcy Rule 2019(d) may look for guidance to the reporting requirements approved by the United States trustee in a trading order governing their respective case. For those entities with numerous trading desks, it appears that amended Bankruptcy Rule 2019(d) would only apply to material changes that impact the holdings of the entity that serves as a member of the respective committee or group, and not those resulting from trading activities of non-committee or group personnel on the other side of the trading wall. Failure to Comply: Bankruptcy courts do not take the failure to comply with Bankruptcy Rule 2019 lightly. Specifically, amended Bankruptcy Rule 2019(e) recognizes the authority of the bankruptcy court to impose sanctions for any violation of the new rule. See Fed. R. Bankr. P. 2019(e) (as amended). Vote designation may conceivably be used by judges as a sanction that would also facilitate confirmation of a plan the group members oppose. Beware! Conclusion: While the contours of amended Bankruptcy Rule 2019 largely remain undefined, one fact appears certain: the debate over the appropriate scope of 2019 disclosure will create much jurisprudence. Accordingly, distressed debt investors will need to think carefully about the implications of the new rule before they decide to participate in a chapter 11 case as a member of a committee or group.